Bruno is a mysterious young man from Satellite. He appears to possess similar skills to Yusei regarding mechanics and technology. Bruno appears after washing up on-shore, taken in by Yusei, Jack and Crow at Ushio and Mikage's request. While with them, Bruno shows off extraordinary skills in machinery and computing, possibly more so than Yusei. Using these skills, he is able to identify the theft of an engine project he and Yusei complete as Jeager and play a role in getting it back. When the WRGP approaches, Bruno becomes an official member of Team 5D's, working in the pits. The truth about Bruno is much darker than his gentle character suggests. Bruno is in actual fact from the future; an android copy of a man and pro D-Wheeler named Antinomy, who witnessed the world's destruction. He was about to be executed by Grannel when Zone, using Yusei's form, appeared and saved him, offering a hand and restoring Antinomy's hope, even just faintly. Alongside Aporia and Paradox, they worked to salvage mankind until only Zone was left. Bruno was created in the image of Antinomy, that which is known as Dark Glass, working as a protector over Yusei and guiding him towards Clear Mind to carry out an Accel Synchro. Whilst duelling Placido, he swerved violently, saving a kitten, but Dark Glass crashed his D-Wheel, Delta Eagle, losing his memories and birthing Bruno. He plays a major part in helping the Signers reach the Ark Cradle and accompanies them as Dark Glass, creating a slipstream that saves Aki, whose D-Wheel hadn't received an upgrade and threatened her chances of making it to the Ark Cradle. 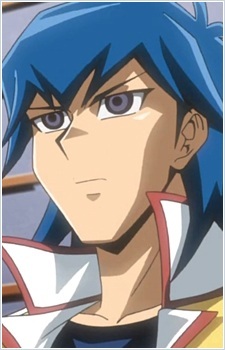 When Team 5D's were separated, he wound up with Yusei. Once he recovers his memories, he resumes the identity of Antinomy, stating that he's a friend of Zone and an enemy of Yusei, challenging him to a Riding Duel. The field changed to an orbital stage, around a star, which died and creates a black hole once Antinomy unleashes the Delta Accel Synchro he has been hiding. When Yusei manages to defeat him, Bruno's Delta Eagle spins wildly out of control and into the black hole, which also expands to swallow Yusei. Inside the darkness, Bruno understands that despite his task in taking down Yusei, he has been a friend and that he himself has always been a close friend to the others and a member of Team 5D's. Delta Eagle begins to struggle under the strain and Yusei offers a hand for Bruno to take, Bruno declines the help, understanding his time has come and requests Yusei does what he can to save or stop Zone, who he has claimed is a friend. Pleased he has enlightened Yusei to the Delta Accel Synchro, Bruno charges his smoking Delta Eagle at Yusei's D-Wheel and with the last of his life, yells out for Yusei to go, creating the power to return Yusei to the Arc Cradle, smiling as his D-Wheel gives out and watches his true friend live on. His damaged visor makes it back with Yusei, who breaks down when he can see the Bruno he always knew smiling through it, beyond reach.